Avocados have become incredibly popular, whether spread on toast, made into guacamole, or chopped into fresh salads. But did you know that you can plant the avocado pit and grow your own avocado tree? Have you ever made guacamole and then wished you could do something with the avocado pit? 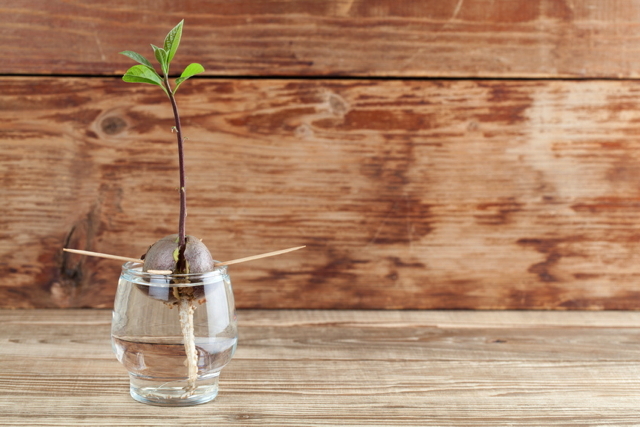 Because the pit is a seed, you can use it to grow an avocado tree in your own home. However, you will not be able to harvest any avocados because the male and female flowers will not open at the same time, inhibiting pollination and fruit development. To grow fruit, you would need two different varieties of avocado trees to enable cross-pollination. Still, avocado trees are beautiful evergreen plants and will look great in your sunroom, living room, or greenhouse. Remove the pit from the avocado, wash it thoroughly, and let it dry. Insert three toothpicks into opposite sides of the pit, about halfway between the top and bottom. Use the toothpicks to suspend the pit over a glass filled with water, such that the bottom of the pit is in the water. The toothpicks are solely there to prevent the pit from falling into the water. They should rest on the rim of the glass. After three to ten weeks, the avocado pit will begin to develop roots and can be planted into a pot. It is important that the upper part of the pit is not covered with soil. The pot will need to be covered with a clear plastic bag or glass lid to maintain enough humidity for the developing plant. The seedling needs to be watered regularly, and placed in a well-lit and warm spot (over 20ºC/68ºF) in order to germinate. Once the plant has developed several green leaves, the cover can be removed and the pot can be moved to its desired location. Have fun trying to grow your own avocado tree with this easy method!